Pattern No D4937 - a feast of colour! 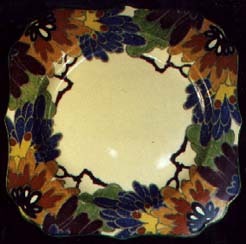 Very hard to find and much sought-after by Art Deco collectors. This pattern is also quite hard to find. 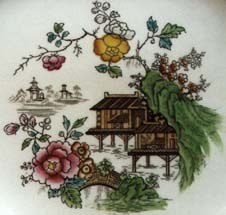 It comes in various colourways including the red and brown transfers shown below, both of which feature beautiful hand colouring. 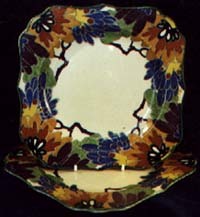 The border is reminiscent of some Spode borders with its complex spirals. The picture below is a close-up of the central portion. On some plates the central temple design is missing, reducing it to a border pattern.